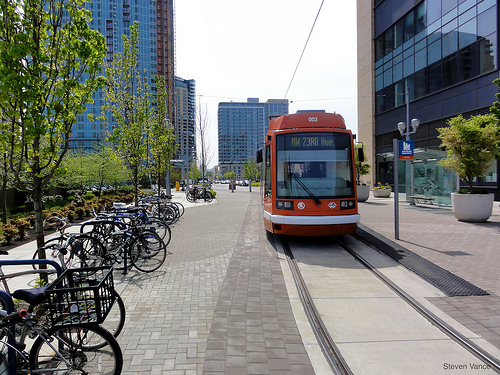 Portland's transit-oriented development strategic plan encourages pedestrian- and cyclist-friendly roads and connects neighborhoods through transit. Photo by Steven Vance. The Center for Transit-Oriented Development (CTOD), along with Nelson/Nygaard Consulting Associates, released a new strategic plan to advance transit-oriented development (TOD) in Portland, especially in areas outside of central Portland that have not had the same momentum for mixed-use and higher-density development. The 84-page document is meant to be used as a guide for future investments by the Metro TOD Program, an initiative of the regional government of the Portland metropolitan area that provides financial incentives to private developers to build higher-density, mixed-use projects located near transit. Limited funding has hindered current efforts to maximize TOD in the region. According to the report, when land opportunity for TOD development increased by more than sevenfold within a decade, the funding for the program did not even double. Lack of funding, uncertainty of market readiness, limited market demand in suburban areas, working around existing infrastructure, need for additional housing, policy support, and complementary assistance from other agencies are some of the obstacles to implementing future TODs, the report states. Despite the challenges, there are also many trends that make the present an advantageous time to invest in TOD’s. According to the report, a growing market preference and demand for TOD; federal support for integrated urban development; a successful track record for current TOD’s; potential for partnerships among jurisdictions, and the likelihood of future investments are some of these reappearing trends. The TOD strategic plan aims to address the constraints and opportunities by strategizing investments, balancing these investments with variable market conditions, leveraging the resources of other metro programs and public agencies, and carefully identifying potential TOD expansion programs. The report continues by highlighting existing conditions for TOD in the Portland region and emphasizes TOD’s role in the metropolitan area’s growth plan for 2040. Although the report serves as a guideline, it also acknowledges the difficulty in pinpointing a single method to achieving the final goal: a livable community. Although prepared with the Portland metropolitan area in mind, the report aims to serve as a national guideline in executing successful TODs, especially with an emphasis on implementation typologies, a tool used for land use visioning. Click here to access the Transit Oriented Development Strategic Plan. You can also watch a podcast on Portland’s transit policy below. The video is part of a PBS series about solutions to the world’s most pervasive environmental challenges. e² transport – Portland: A Sense of Place from kontentreal on Vimeo.